When Seth Hay arrived at the "Distant Worlds: Music From Final Fantasy" concert last weekend in Toronto, he was met with a lovely surprise. His girlfriend, Cheryl Murray, had bought him tickets to a meet-and-greet with legendary Final Fantasy composer Nobuo Uematsu and conductor Arnie Roth. After the show, they would get to hang out with the duo, a prospect that Hay said had him "very geeked out." But Hay had his own surprise planned. It involved Cloud, Aeris, and a brand new ring. "As the concert went on, I got nervous a bit," Hay said to Kotaku. "Once the time came, Arnie announced that 'Cloud' has a special message to share." Video started to roll. Final Fantasy VII's "Aeris's Theme" began to play. 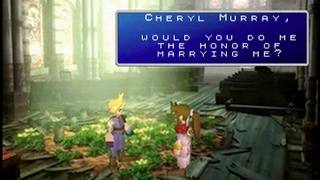 And the crowd watched as Cloud gave Murray the message Hay had composed for her: "Cheryl Murray, would you do me the honor of marrying me?" "Never have I imagined I would propose in front of over 3,000 people in a Distant Worlds concert," Hay said. "We did meet with Nobuo and Arnie afterwards. We joked, laughed, thanked them for helping out with the proposal and the two congratulated us on our engagement. "My now fiancée is excited and happy to come out with something to remember forever."